Some Telluride, Colorado real estate brokers are only concerned with helping you buy property. As your Telluride Real Estate Broker, assisting you with your purchase is my main concern as well. However, I feel that part of my responsibility involves helping you get to know the Telluride area activities and attractions that it has to offer you. 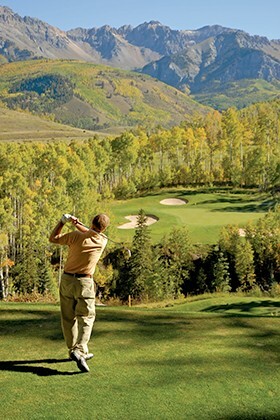 In addition to wonderful skiing, Telluride offers an abundance of recreational activities, such as horseback riding, mountain biking, fly-fishing, hiking, golfing, tennis and more. Besides outdoor pursuits, there are also plenty of opportunities to enjoy fine dining and shopping as well. There is even a selection of museums and historical areas to enjoy as well as a strong arts community and a full line up of festivals-all within the Telluride Colorado region. The arts are not all neglected in Telluride. In fact, Telluride boasts a thriving love of the arts. As such there are plenty of opportunities to enjoy music, fine arts, theater, and dance. Some of Telluride’s permanent art organizations include the Ah Haa School for the Arts, the Sheridan Arts Foundation, the Telluride Repertory Theater, and the Telluride Choral Society. To learn more about cultural life, entertainment, and recreational activities in Telluride, Colorado, be sure to contact me for help. I’ll be happy to serve as your guide to all things related to Telluride, as well as your number one resource for finding a property that suits your needs. Whether you seek a condo, townhome, fractional property, ranch, or luxury estate, I can help you accomplish all your real estate goals. Planning to sell? I can help you find a buyer and obtain a desirable bid for your Telluride land or home. Just contact me through my secure email form, or phone me at 970-729-2278. As your Telluride Real Estate Broker, I want to help you learn all about Telluride and area recreation. I love to teach and will take the time to explain as much about Telluride and the surrounding areas as you wish to know. The more you know about the area, the easier you’ll find the process of determining your purchasing needs. The recreation and entertainment available in Telluride is simply outstanding. Most likely, you’re already convinced that the area boasts some of the most beautiful sights in the world. Likewise, you probably agree that the skiing here is simply superb. Perhaps best of all, there’s practically no wait for the ski lifts! However, there is so much more recreation to Telluride than skiing and snowboarding, there’s a plethora of outdoor activities such as, golfing, camping, hiking, mountain biking, mountain climbing, fishing, snow shoeing, horseback riding, 4×4, ice climbing and more. In addition, there are weekly concerts and festivals throughout the summer. Summer festivals are a big reason that many people visit Telluride or buy Telluride Real Estate. The community is literally packed with good music, art, and delicious food festivals on the weekends from May to December. There’s even a wine festival in June that serves to bring a little joy to nearly every palette. From the Telluride Mountain Film Festival and the Bluegrass Festival to the Telluride Jazz Festival and Blues and Brews Festival, there’s entertainment enough to make the spring and summer just as memorable as ski season. Depend on me, Raymond Bowers, as your guide to Telluride recreation and festivals. I can assist you with everything from market values, building prospects, and tax assessment appeals, to cultural and recreational opportunities. Contact me through my secure online form or by phone at 970-729-2278.